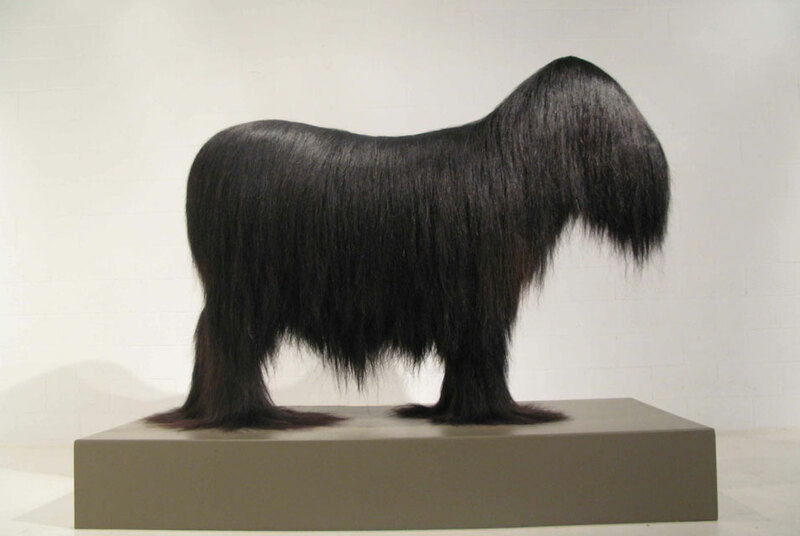 "Cauda Equina" by Keith W. Bentley, 1995-2007. Photo: Stanzie Tooth. NEW YORK, NY.- Dead or Alive, presented by the Museum of Arts and Design from April 27 through October 24, 2010, will showcase the work of over 30 international artists who transform organic materials and objects that were once produced by or part of living organismsinsects, feathers, shells, bones, silkworm cocoons, plant materials, and furto create intricately crafted and designed installations and sculptures. Organized by the Museums Chief Curator David McFadden and Curator Lowery Sims with Assistant Curator Elizabeth Edwards Kirrane, Dead or Alive features new site-specific installations and recent work by contemporary artists from around the world, including Jennifer Angus, Nick Cave, Tessa Farmer, Tim Hawkinson, Jochem Hendricks, Damien Hirst, Alastair Mackie, Kate MccGwire, Susie MacMurray, Shen Shaomin, and Levi van Veluw among others. A special weeklong visitor preview starting Tuesday, April 20, will allow MAD visitors to observe artists as they create and install site-specific works in the museum galleries. New commissions include works by Costa Rican artist Lucia Madriz, who will create a massive, politically charged floor installation made from black beans and rice; German artist Christiane Löhr, whose fragile nests of thistle and dandelion silk will be installed in the Museums lobby; American artist Jennifer Angus, known for her architectural interiors covered with thousands of dried insects that are pinned to mimic vintage wallpaper; and Kate MccGwire who will create a large cascade of pigeon feathers emanating from one of MADs signature glass bands that cut across the gallery ceilings. Chinese artist Shen Shaomin will create imaginary animals made from pulverized bones; and internationally renowned installation artist Xu Bing will make a shadow version of a 24-foot Song Dynasty painting using only vegetable detritus, weeds, leaves, and roots. Dead or Alive follows upon themes first presented in the inaugural exhibition of MADs new home, Second Lives: Remixing the Ordinary, which featured contemporary works created from multiples of ordinary manufactured items. Here, the materials used are entirely natural. Once-living parts of flora and fauna are recombined and rearranged into works of art that address the transience of life, and all that is elegant and alarming about the natural world.  German artist Christiane Löhr creates sculptures from the most fragile of natural materials, such as burrs, seed pods, and strands of animal hair. For Dead or Alive, Löhr will capture the ephemerality of nature with nets of dandelions and thistle.  American artist Nick Cave uses leaves, hair, twigs, and other found objects to create bold costume-sculptures called Soundsuits. When worn, the Soundsuits are brought to life and create a loud swell of noise as the performer movesa meditation on the power of ritual and ceremony.  Dutch performance artist Levi van Veluw also layers natural materials on the human body in his elaborate self-portrait photographs and videos. In his landscape series, van Veluw adheres miniature plots of grass and clusters of trees onto the contours of his own face, overturning traditional concepts of landscape by placing the human body at its core.  Jennifer Angus also subverts familiar forms with her site-specific architectural installations. Built to mimic interiors furnished with traditional wallpaper and textiles, the works are actually ornamented with thousands of dried insects pinned directly to the wall. These installations blur the distinction between decoration and expression, and between domestic comforts and disturbance.  Cuban artist Fabian Peña employs insects to explore the endless cycle of life and death, and to comment on the foulest conditions of human existence. For The Impossibility of Storage for the Soul (2007), Peña has rendered an image of the human skull using only clipped cockroach wings. Mounted on a light box, the wings cast an eerie amber glow into the gallery.  American artist Christy Rupp uses the bones of chickens discarded by fast food restaurants to create life-size skeletal reconstructions of extinct birds, including the Great Auk, the Moa and the California Condor. Her Dodo Bird, on view in Dead or Alive, is a meditation on man slowly devouring his environment.